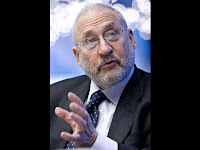 The Public-Private Investment Program, PPIP, designed to buy bad assets from banks, “is a really bad program,” Stiglitz said. It won’t accomplish the administration’s goal of establishing a price for illiquid assets clogging banks’ balance sheets, and instead will enrich investors while sticking taxpayers with huge losses. “You’re really bailing out the shareholders and the bondholders,” he said. “Some of the people likely to be involved in this, like Pimco, are big bondholders,” he said, [Uh, Huh!] referring to Pacific Investment Management Co., a bond investment firm in Newport Beach, California. This entire article is good, one of the few where someone is hitting the nail on the head. My personal belief is that “Japanese-style malaise” is the very best case outcome. The media and a few economists are FINALLY beginning to get to the heart of the matter. The roots. If I could boil my position on the economic mess into two themes, or meme’s, they would be that THE MATH DOES NOT WORK (Death by Numbers; When the Math No Longer Works...), and that CORPORATIONS AND THEIR MONEY NEED TO BE SEPARATED FROM THE STATE (especially central bankers; Huh? Interest Bearing Fractional Reserve Money by Fiat… Doh! ; The Dawn’s Early Light… Calling all PEOPLE to get us through the night!). Another person who really gets it and is in a position to know is William Black. Man, does he tell it EXACTLY LIKE IT IS! BRAVO, Mr. Black, you are one of the people who need to be running the show to restore REAL AND LASTING confidence in our financial system. Listen to his interview yesterday on Bloomberg by clicking on this link - William Black on Bloomberg. And if that isn’t enough, here’s the interview he did with Bill Moyer - William Black on Bill Moyer’s Journal. At this very moment, more than 200 federal regulators are examining our 19 largest banks — supposedly, if you believe Washington, to determine which are strong and which are at risk for failure. But in the first quarter, the U.S. economy contracted two and one-half times more than that — at an annual rate of 5%! But unemployment is already higher than that — at 8.5% and more than 600,000 more jobs are being lost each and every week! Not only is the economy already shrinking much faster than 3.3% ... the Obama administration itself has warned that unemployment will be much higher than 8.9% this year! Our own government is clearly cooking the books— using these false criteria to deceive you; hoping you’ll trust banks that are clearly hanging by a thread. >> Large chunks of the entire commercial real estate sector go the way of GGP — the nation’s second largest shopping mall operator that declared bankruptcy yesterday. Our soaring deficits drive interest rates sky-high and gut the dollar, driving our cost of living through the roof. - and it has them TERRIFIED! This is why I’ve warned you that, in the next phase of this crisis, literally hundreds of banks and other lenders will be pushed to the brink — and OVER the brink — demanding hundreds of billions of dollars; perhaps even trillions in new bailouts. This is why I’ve repeatedly warned you that the recent stock market rally was nothing more than a dead cat bounce — a bear market trap — and urged you to use it to dump stocks before it’s too late. Sorry to pop everyone’s HOPE bubble, but a stress test designed by the bankers for the bankers is nothing more than a continuation of keeping hopes high while playing hide the sausage. Who sets the parameters of the “stress test?” Who determines pass or fail? Will they use it to say everything’s okay, or will they use it to ask for more money claiming that the system can’t allow failure? You want a stress test? How’s this… force the banks to mark all their assets to market and completely open their books to ME, the taxpayer who is giving them money! That way I can determine if they are simply covering up more debt and derivatives that they do not have the real capital to cover. I, however, don’t really need to see their books, and neither do you… we KNOW they stink to high heaven or the books would have been opened a long time ago. Want to get to the heart of the matter? There it is. The math does not work and we must separate corporations and their money from our political system!